We need to find permanent homes for the U.S. Open and Nationals, and develop and market them into big properties, like tennis and other sports did with their major events. I'm leery of trying to do both at the same time, so for now I'm leaning toward turning the Open into our huge showcase event, just as USTA (tennis) did with theirs. But most of what I write here could also apply to the U.S. Nationals. There are two ways of turning the Open into a "big" event. You can go for more players or you can try to turn it into a big money event with TV coverage and spectators. Currently, and for many years now, there's been little real incentive to do either of these. The paid staff is not in charge of doing it - they have their own jobs to do - and most volunteers have little incentive. No one's in charge of trying to turn the Open into a big event, where it's their top priority, and so it's little wonder it has never turned into a big event. It's not going to just happen spontaneously. The single most important thing we need to do is find a permanent home for the U.S. Open, near a large metropolitan area, where there's a local supporting group that has strong incentive to turn it into a huge event. This should be the single biggest table tennis property in the U.S., and every serious table tennis region would love to be the hosts. But which ones can really step up and make the commitment? We won't know until we put it out to bid. There are strong table tennis communities in the Bay and LA areas on the west coast, in the NY/NJ and MD areas on the east coast, and perhaps in other regions, such as Las Vegas, Florida, Atlanta, or Houston. Which of these or other regions wants to make the U.S. Open "their" permanent property? This would be one of those landmark events, where regions are given perhaps two years to put together their bids - time for them to bring in personnel, create plans for marketing and sponsorship, and perhaps most important, to line up those sponsors, which would mostly be local ones who want to bring the U.S. Open to their region. The USATT CEO would likely be involved, working with these regions as they put together their bids. The goal is to end up with multiple great options. Where it ends up should be one of the most difficult and gut-wrenching decisions we'll ever have to do - but it should be a choice between great options. USATT would, of course, retain ownership, with the USATT CEO in overall charge of many aspects, just as USTA does with their U.S. Open - but now they'd have a committed group working to build the event up into a major property. And that's exactly what is needed. USTA (tennis) found a home for the U.S. Open tennis championships in New York City. They marketed it for years, found sponsors, and kept building it up until it became a premier event. It's all about the marketing and sponsors - things that don't happen by themselves. USATT has never really done this sort of thing in any serious way. By finding a permanent home with a strong local group trying to build it up, USATT doesn't need to do so - and so it can focus on what it should do well, which is oversee it to make sure it's run properly, while working with the committed people build it up. There's one other group that can greatly help USATT with this. Once we have sponsors so we can build up prize money, the ITTF is great at promoting showcase events, and they have also told us they'll add to whatever prize money USATT can come up with. Some are unhappy with ITTF about the new plastic balls and other issues, but when it comes to running premier table tennis events, they are invaluable. We want to be a regular on the ITTF Pro Circuit, with the U.S. Open a premier event in the U.S. with the best players in the world coming here, turning the event into a major media event (with the proper marketing), which would lead to more sponsors and more prize money, turning it into an even bigger event. But it won't happen until we find the committed group that'll put in the work to make it happen. And finding that group and turning much of the control of the event over to them - which some USATT people will likely find difficult to do - is how we can make this happen. We can't do it alone, which is what we've tried to do throughout our history. They were held this past Fri-Sun in Washington DC, at the Gaylord National Convention Center at National Harbor. Here is the home page for the event, and here are the results - for every single match! A big thank you goes to North American Table Tennis, who ran it; Tournament Director John Miller and Tournament President Richard Lee; and the many umpires and others who volunteered. And here's the winning team! The tournament had 825 players, 207 teams, and 153 tables. How big was the venue? I always like to watch new players as they see it for the first time - there's usually this "Wow!" look as they walk in. Here's a video (30 sec) that shows you the venue. I was there coaching, and because of that, I rarely got to see the top-seeded team play. During the Open Final I was busy coaching another final - the Division 11 finals! I coached the MDTTC Musketeers - L-R: Daniel Sofer, Daniel Gong, and Benjamin Clark, with me yelling something in the back - and they won the final 5-0! I did get to watch new Nigerian star Quadri Aruna, who recently shot from world #73 to #30. He's an extremely fast two-winged looper (aren't they nearly all? ), with two things that seemed interesting, at least in the matches I saw. First, he does a lot of backhand serves, often from the middle of the table, like Dimitrij Ovtcharov. Second, unlike many banana-flipping crazed world-class players, he did a lot of short pushing. 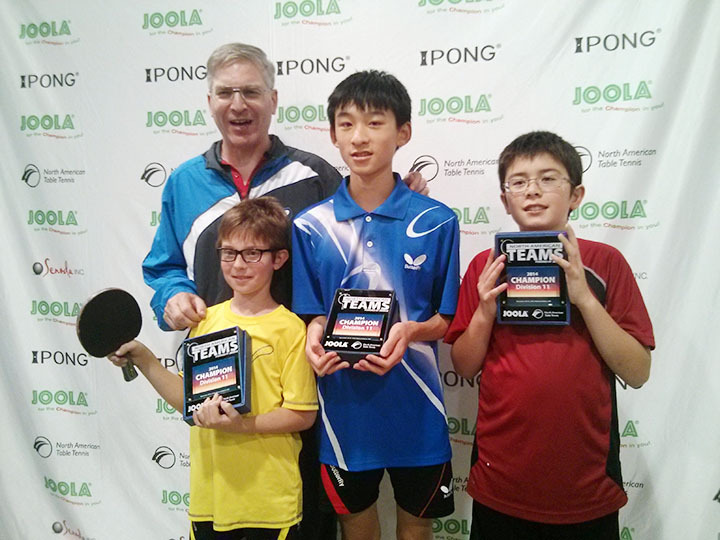 He played on Team JOOLA along with Chen Weixing and Jorg Rosskopf, which lost in the final 1-3 to the Atlanta team. I spent much of the tournament coaching Daniel Sofer (from MDTTC Musketeers) and Nathan Hsu. I started calling Nathan the "1.95 man" because of his habit of losing the first and falling behind in the second, often game-point down (twice) before coming back to win. (He did this in back-to-back matches, but came back to win the second both times from down 9-10 and 7-10.) If you want to win at any level, it's best not wait until you are down 0-1 in games and down game point in the second to start playing your level! It takes time to really get into a match as you adjust to the opponent's shots, but you really need to pretty much be there after 6-7 points. On Saturday afternoon the MDTTC "A" Team played Spin New York. Since Nathan sat out that match, I wasn't needed as a coach, and so I volunteered to scorekeep, which I did for three matches. (I couldn't umpire - conflict of interest.) Alas, MDTTC lost all three matches where I was scorekeeper (and the team match), and so perhaps I better stop scorekeeping? Also, am I the only one who noticed that Spin New York (who made the semifinals) is Spin NY, or Spinny? I'm tired of the plastic ball issues that I've blogged about repeatedly, and don't want to spend much time here. The JOOLA plastic balls used played okay, but did break too often. While warming up with one student in the morning we broke three balls in fifteen minutes. It wasn't normally that bad, but the balls did break perhaps every two matches, maybe a bit more. One of our top players kept flipping balls into the net, and lost a match because of this. He'd been playing in celluloid tournaments up until about three weeks before or so, and since making the switch to plastic, hadn't really worked on his forehand flip. When one opponent started serving short there, he kept missing the flip - the ball was heavier than a celluloid, and so his normal flipping stroke didn't work, and so he was likely trying to consciously adjust, which rarely works. And so he swatted balls all over the place and lost. After the tournament ended I grabbed a bunch of balls - Nittaku Premium, which will be used at the Nationals his next tournament - and worked with him on his flip for half an hour. I think he's set now, but it's a reminder to make sure everything's ready for a tournament! One junior I coach as an attacker didn't have confidence in his attack, and so after many months of looping practice, turned into a pusher/blocker/flat hitter in the tournament. We'll work on that - it looks like we need to play a lot of simulated games where each rally starts with him looping. I've been going to the Teams since 1976, usually as a player, in recent years as a coach. So this was year #39 for me. I'm feeling old! They were held this past weekend in Hobart, Indiana. Here are a flurry of articles on them by Barbara Wei. They are taking place right now, Nov. 30 - Dec. 7, in Shanghai, China. Here's the ITTF home page for the event, where you can find results, articles, pictures, and video. Here's an article that features Team USA. The USA Boys' Team is Kanak Jha, Krish Avvari, Kunal Chodri, and Aashay Patel. The USA Girls' Team is Lily Zhang, Prachi Jha, Angela Guan, and Crystal Wang. Here's an ITTF press release that features Lily Zhang. As of this writing, USA Girls are in the quarterfinals, where they will face South Korea on Tuesday. USA Boys lost to Poland 1-3, and will be playing Argentina on Tuesday in a playoff for 13th and 14th place. Here's the new video (4:49) from PingSkills. Are You Too Old to Start Playing Table Tennis? Here's the new coaching article from Expert Table Tennis. "Fan Zhendong is 17 years old and has already achieved more in table tennis than most of us can ever dream of. Does this mean we should all just give up now? Are you too old to start playing table tennis? And is it even possible to master such a complex game as an adult?" Here's the video and tutorial (3:51), showing it in slow motion and with the major points explained. Here's the video (36 sec) - my students are in for now! PingSkillers Question of the Day - 2:40: What percentage of your serves are short as opposed to long? PingSkillers Question of the Day - 3:14: Could your club survive without its volunteers? PingSkillers #QOTD - 2:15: Should edge balls be ruled as out? Here's a video (17 sec) of some rapid multiball by the German star. Here's the video (47 sec) of Par Gerell of Sweden (world #39) as he lobs and fishes against Panagiotis Gionis of Greece (world #20). Here's the tribute video (6:43) of the World and Olympic Champion. Here's a video (4:43) of 10-year-old Jimmy Goodwin knocking down targets. Here's the video (13 sec)! It hurts my knees just watching this.